I'm spending a lot of time quilting something, but it's not ready to show, so I'll just put out my little girl ghost quilt again as I finally finished it off. It's not an original design, but I already blogged about the link, so just scroll down if you're interested in making your own. I like how it turned out and will take it down to my mother's nursing home this morning to hang on her door. I decided to use a 100% cotton variegated thread from Gutermann but remembered half way through why it was sitting unused in my sewing box. I spent a lot of time rethreading the machine and muttering under my breath as it broke a lot. Good thing it was a small project. The other thing I wasn't thrilled about was the way it pooled on the solid borders. Now that is something I could have thought about ahead of time and used a matching thread, but unfortunately, I didn't, and it's not in my nature to rip out and redo! Just to be fair to Gutermann threads, I use their polyester ones all the time and have never had issues with them. I also finished up my Wee Bee Canadian blocks before the end of the month and mailed them off. The block was Road to Tennessee and scrappy Christmas with no white was requested. I dusted off my festive scraps and made these. Some of these fabrics have been in my scrap bag for years, so I was happy to put them all together. I hope they can blend in with the other blocks! 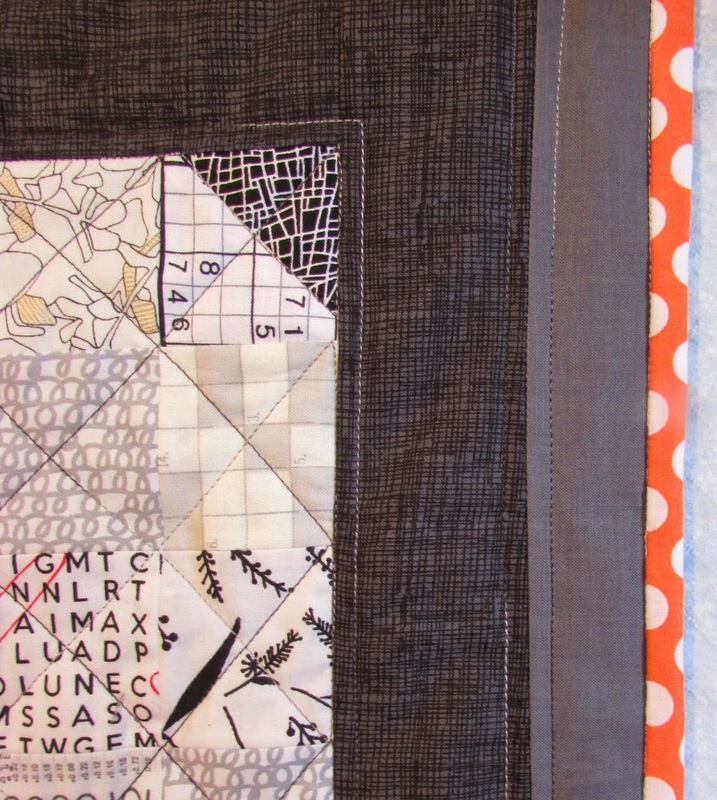 I'm linking up with The Needle and Thread Network and Sew Fresh Quilts today. I love looking at what others are working on and get lots of inspiration from them. Really like the ghost. Great door hanger. What lovely ideas you have! You're not the one having problem with Gutermann cotton thread. You have to use it like a cone, having the spool lying horizontally or using a cone holder. I have done machine appliqué with it, and it broke a lot. When I change its position, really less breakage. Your ghost is really funny. I love your little ghost quilt. I'm sure it will brighten your mother's wing right up for Halloween! Ermergersh! She's so cute! I love how the variegated thread moves the thread color. Fun! Thanks for playing along with the Boos and Ghouls quilt along! Yah!